We are almost 1/12 of the way into this New Year. I pray it is going well for you. Have you stopped and taken time to consider which way you are looking or headed in 2016? In Hebrews 8:1-13, the author is reminding people that we now live under the reign and mediation of a new covenant. We live with the very promise and presence of Christ, who has in effect, cancelled the old covenant that was based on law codes and works, and now can look ahead to see a new way of life, new possibilities, new hopes, and a much bigger and brighter way of life. Which way do you find yourself looking? 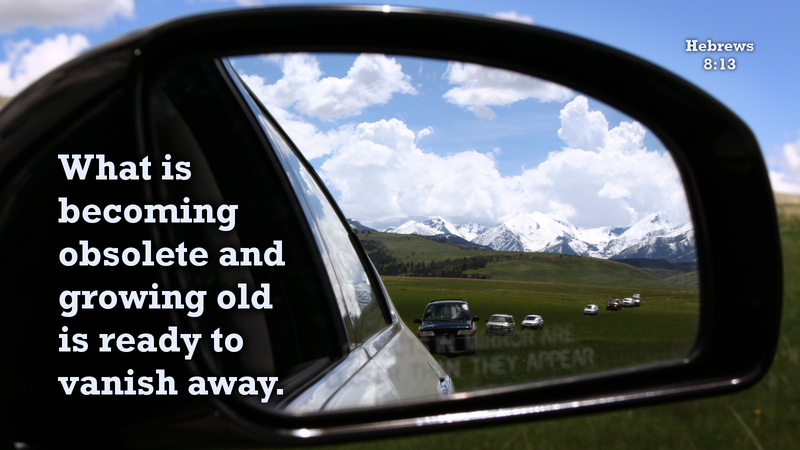 Are you focusing on the rear view mirror of what was, before the new covenant, when laws and rules held the covenant? Or do you live, looking forward in faith to the direction and the promises that Christ is holding in front of you? Rear view mirror or windshield view… Which way are you looking? Prayer: Lord, help us to focus our eyes and live our lives, looking at what lies ahead in you. Amen.